Mosquitoes and I, we’ve got a love-hate relationship going on. They love me, I hate them. Whenever I say this, there’s always someone in the crowd who claims they know what I’m talking about, that they have much worse problems with mosquitoes than me and my complaint is nothing in comparison. Then I disclose that I’m allergic to the saliva that mosquitoes inject, causing every bite to turn red and angry and swell to the size of a lemon. Every partner and boyfriend I’ve ever had claims he’ll take the burden from me, lay himself in sacrifice to protect me from the big, bad stingers. I want to believe him, so I douse myself head to toe in DEET, while he sleeps next to me unprotected. The next morning, my “protector” has one or two bites, and I’ve got more than a dozen. 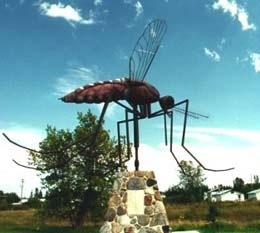 Apparently, the mosquito did a blind taste test and decided to use him as an appetizer and me as the main course. Why have sirloin when you can have filet mignon? 😉 LOL. What can I say? I’m tasty. This apparent tastiness gets me bitten in Granada, Spain in the dead of winter while there is snow on the mountains; on a crowded bus in Athens in January; in an air-conditioned office without windows. If I forget to spray the bottoms of my feet and between my toes, that’s where I’m bitten. If I don’t dab a bit on my ears or mist the top of my head, I’m bitten in the part of my hair and behind my ear (do ears even have blood?). If I forget to lift my long hair and spray my neck, I’m bitten there. If I take off my shirt for 15 seconds to put on a new one while traveling, I’m bitten. I once opened the sunroof of an SUV I was driving, and within a few minutes, a mosquito flew in at 40 mph, bit me and escaped. On a trip to India, eleven companions thanked me for being around because none of them got bitten. It would almost be amusing if it weren’t painful. In the first 12 hours, bites swell like welts. After 24 hours, they’re the size of lemons except angry and red, hardening the skin to the point that joints don’t bend easily, I feel dizzy and my body feels like it’s pulsing with poison. Calamine, cortisone, ice packs and anti-histamines are of little or no help. Sometimes a paste made of water and meat tenderizer has a cooling effect, but it’s messy and the swelling remains for at least three days. And after a week or two, the deep red angry itchiness finally subsides. So how do I avoid this? By remaining covered in DEET, outdoors and indoors, 24/7 day or night in summer and anytime we travel no matter if it’s winter, spring or fall, accompanied by two liquid/tablet machines within a living room space. Needless to say, I am not a camper or sleep-on-the-beach type person. And why is this on my mind? Because my Greek counterpart and I were sleeping with one (not two) liquid/tablet machine and the air conditioning running the other night, and I mistakenly believed I was safe. Now I’m covered in lucky number 13 bites. Aside from wearing mosquito net clothing, there is a remedy I haven’t tried that affords one year of immunity. You go to a mosquito-infested area, lay down and allow the buzzers to bite the crap out of you — tribesman who perform this annual ritual swear by it. How about a plain old mosquito net around your bed. We have one at our house that my wife picked up at Pottery Barn in California… Works like a charm. It’s not light like most people will tell you (“close the curtains or the mosquitoes will see the light and come in”) and I guess mostly not the smell. They are tuned to “breathers” emitting CO2. You can actually buy mosquitoe traps that use a bottle of compressed CO2 to attract the buggers. As to why they prefer some people: No idea. I’m mostly lucky and wish you “περαστικά” for your bites! I am usually bitten by everything too and my husband laughs. I don’t have a bad reaction though…I feel bad for you. Back home there is a mosquito epidemic because they had so much rain recently. My sister says that they are even attacked during the day and most repellants don’t work. It’s a good thing that you aren’t in Wisconsin now!! My mom says mosquitos only go for the good blood so that’s something… you have good blood. I’ve never had a problem with them… I could count on one hand the times in my whole life I’ve been bitten by them. Even in India, they steered clear of me. I dunno what is wrong with my blood… in fact I’m a little offended. I know what you feel, because.. not so many days ago, while it was still hot here (in athens), I was getting up with 6 or seven bites on my feet. Even once one bite me between the fingers of my feet. But at least those chemical things that kill the mostquitoes works for me. I bought one when I was living in Irakleio, and it was a massacre in the Kunupia population. Also I have nice skills to hunt them with my hand. In the beggining I wasnt able even to catch a fly, now I got used to kill them with my “bare hands” (not kidding). They take revenge when I sleep, even if I put the dead corpses of their friends in the window to warn them. G – Laying corpses didn’t work, only the dual tablet/liquid machines and DEET at 15 percent concentration. I get bitten a lot, and swell moderately but not as bad as you! It is the itching that drives me crazy, all day and all night. And the damn mosquitoes always manage to get me between fingers and toes somehow, the little jerks. Usually when we use the A/C we get pretty lucky, of course we stay closed up tight, and we have cats killing some of the skeeters that break in. But weeks like this past one when it is cool and you just have to open up, ugh. I’m nursing a nice bite on my elbow right now. I’m so glad the new house has screens. If it makes you feel any better, about a month ago, I had a huge bite on my pinky finger knuckle.. my fingers in general are big (ring size -10) and my pinky blew up to the size of my two thumbs.. anywho I didn’t know what the hell happened, so of course I went to the doctor thinking I broke my finger, being that I couldn’t even bend it.. and to my disbelief it was just a mosquito bite. I am 100% positive my doctor has shared this pitiful story with many..
After almost 11 years, could you find the solution for this awful issue? I am having weird bites since Nov. 26, 2017 and not happy at all. It is not very often, but I had never had so many in a few days. One Hispanic doctor told me to take 1000mg Vitamin C three times a day until it disappeared (three of them turned into “cellulite”, according to him) and this helps for a while. Suddenly… voilà un’autre fois!!! I am so sick and tired, too :(. Yes, it’s called DEET. That’s the only thing that works. Vitamin C is nonsense.